Are You Really Ready For Parenthood? For some women, parenthood is a milestone they can’t wait to reach. If you’ve ever seen a cute baby, then you’ll know exactly why! Although having children is wonderful, it can be very hard work for an inexperienced woman. Before trying for babies, it’s important to think about the connotations, and how ready you are. Here are some important questions to ask yourself. What were my parent’s successes and failures? Let’s face it, there’s no such thing as the perfect parent. Even though your folks probably did a great job at raising you, there must have been one or two things they could have done better. When you have kids, as much as the idea might shock you, you’re going to make a few mistakes as well. I’m not talking about the times you stormed to your room in the height of puberty; that’s just part of growing up. You should be more wary of things that were actually harmful to your development. Were your parents hostile to a hobby or interest you had? Did they call you cruel names when they lost their temper? Did they hit you? While these things are often understandable, they’re not exactly helpful to the development of a healthy child. Why do I want to have kids? This is perhaps the most important question you can ask yourself before motherhood. The right answer is that you’re ready and excited to raise another human being. While this might be what you’re telling your friends and family, is it really true? Some people try for babies because they think it might mend a failing relationship. I’m not saying this has never happened, but more often than not the child becomes the straw that breaks the camel’s back. If you have a kid with someone you don’t truly love, then there’ll be all kinds of problems you’ll have to work through further down the line. Children aren’t pets or commodities; they’re human beings. Before you take a single step towards parenthood, make sure your heart is in the right place. Am I financially stable enough to have kids? This might strike you as a bit of a callous question. True, people from all economic backgrounds have children all the time. However, having a child when you’re not financially ready for it can be a huge mistake. Raising a child from 0 to 20 will cost well over $300,000. If you’re struggling now, then get a handle on your personal finances. Start saving more, consolidate credit cards and erase other debts. Then, start living as if you really had another person to feed and clothe. I hate to tell you this, but most of your leisure activities may have to halt there and then. If you feel you can live like this comfortably, then you may be ready. If not, give it another year. There you have just three important considerations before having kids. The job of being a mother isn’t easy. Take it from me though, it’s more rewarding than any career! If you know a couple that’s expecting, then you know they need a plethora of items for their new bundle of joy. If you need help picking out a gift, this blog post really digs deep. While most new parents-to-be concoct an actual baby registry list, there are some baby items that new parents really want. Some of these are really practical and will be used often, and others are just fun but appreciated just the same. Cute Clothes Most new parents stock up on basic onesies and sleepers for their new baby so they’ll appreciate if you splurged and went all out. You can buy baby hampers in Australia from Baby Gift Box Company, including ones selling designer clothes. They have a designer gift basket for girls that features pink ruffled bloomers made out of 100% cotton, a matching cotton bodysuit, Mary Jane style socks, and a personalised gift box. Children’s Books Nowadays, it’s becoming popular to sign a book instead of a card at baby showers so that the new baby has a full library as soon as they arrive. You can go with that idea or you can prepare a basket with lots of children’s favourites like Goodnight Moon, Harold and the Purple Crayon, and The Tale of Peter Rabbit. Diaper Bags for Both Mom & Dad Nowadays both mom and dad need diaper bags for when they run errands. It makes it easier to leave each bag in separate cars. Consider making the mom’s the main bag by finding one big enough to hold both bottles and baby food in insulated compartments, as well as several other pockets not only for diapers, but also for a small first aid kit, and phone. For the new dad, try to find the more modern combination of a diaper-messenger bag. It kind of looks like it holds his laptop and can hold his phone or e-reader in a compartment, but there are plenty of pockets for diapers, wipes, and anything needed for a car ride. Modern Feeding Supplies Do you want to help the new parents keep up with the times? Then consider gifting them some of these cool gadgets like a baby food dispensing spoon. It keeps feeding time easier and neater because all they have to do is fill up and squeeze the spoon for the baby to receive the food. Along with that, you could give them a baby food maker, where they can make their own out of various fruits and vegetables. In addition, as they grow older, they may have use for the cooling plate, which allows table food to go from hot to child-friendly warm in under a minute. Car seat/Car seat CoolerEvery set of new parents needs a high-quality car seat like a Graco My Ride that holds up to 40 pounds facing backwards, and then can be converted to a forward facing toddler seat. If you live in a warm area, supplement this gift with either a car seat cooling pad or a car seat sun shade so that the baby is not exposed to too much sunlight. While you can buy these gifts, don’t forget that sometimes new parents cherish homemade gifts or even a kind thought too. Ask any new mom and she’ll be extra grateful if you came by with a hamper full of dinner, cleaned her kitchen while she took a nap, or offered babysitting services so she and her husband could enjoy a night out. There comes a moment in a relationship that’s gone bad that you realize and you accept it’s done. Those words, “it’s over”, ring through your head. You might not even remember which of you said it first, or last. But you know it’s the truth. And there is a sense of calm about that fact when you accept it. After what may have been months of unhappiness and argument, you know all of that is over too. Of course, life is about to be very different. You have freedom and also more restraint than before. You’re about to be a single parent. And you’re also about to be free of a relationship that really got you down. Your feelings will change. There will be anger, sadness, relief, and even joy. But it’s not your feelings you need to be concerned with right now. Your kids are about to go through hell. When they learn that Daddy and Mommy are no longer living together, they will be devastated. Even if they know you are both happier living apart, they can’t understand yet how that will work. They fear a situation they’ve never experienced before. One parent won’t be there. So what can you do? Kids need routine, security, and love. Create a routine you can all stick to, and make it clear that both parents will always be available. You may choose to move swiftly with the legal side of your separation. This can be very helpful if there is a new partner on the scene. The divorce lawyers at Skillern Firm believe that an amicable divorce is the easiest and least painful way to move forward. It takes the pressure off the parents, and this reduces the stress for the kids. At this stage of your separation, only the lawyers may be talking to each other. However, it’s important you find a way to politely communicate with your ex, for the sake of the kids. Being the only adult in the house with the kids can be difficult. You won’t be able to go out in the evenings without getting a childminder in. And you’ll be solely responsible for the cooking, cleaning, and shopping. This can take quality time away from you and the kids. Share the tasks wherever possible. If you can afford it, get a housekeeper in to help, so you are free to be with the kids right now. Children can often push boundaries at this difficult time. They can feel the situation is all about them. Try talking candidly with them. Speak about how hard it is being a newly single parent. Talk about your own sadness about the situation. And be honest about how you and your ex can be better parents when you’re apart. 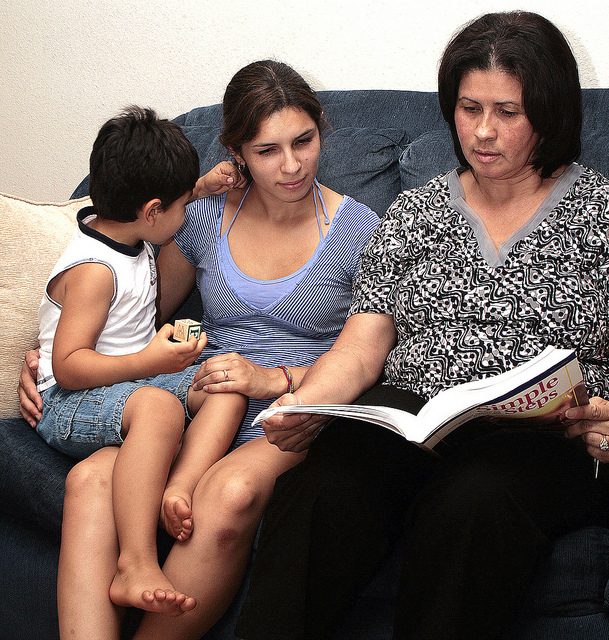 If things are still difficult, family counselling can be very helpful if you’re all willing to attend. You may be surprised at how quickly you fall into your new routines and feel comfortable with how things are. It may get tricky again in the future when new partnerships are formed. But for now, you and your kids can share some quality time together. Sometimes, you’re a single parent from the moment your child is born. Other times, you could have a partner but things don’t work out, and you split up. Either way, there’ll come a time when your child starts asking questions. They’ll wonder why they don’t have two parents, and you’re going to have to explain things. For me, you have to tell your children about the situation. You can’t lie to them and try to keep them in the dark. Explaining things can help them understand why things are the way that they are. And, it can bring you closer as a family. I think it’s really important that you try and stay in contact with your ex-partner. You don’t have to be best friends, but it helps if you’re on talking terms. I understand that many single parents are the product of a divorce. And, lots of divorces don’t end in a good way. However, you need to try and extend the olive branch, for your children’s sake. Trust me; they’ll find life a lot easier and better if their parents are speaking. Otherwise, you may rely on them as your means of communication. Both of you will tell your child to pass a message on to their mother/father. It can be horrible putting them in a situation like this. My advice is to do all you can to be on speaking terms at the very least. You can text or email one another; you don’t even have to meet face to face. A lot of single parents fall into the mental trap of thinking they’re alone. They want to try and do everything by themselves; it’s a natural reaction to being a single parent. Especially if you’re a single mother and the father left before the baby was born. You can feel abandoned and get the mentality that you have to do it all. But, I’m here to tell you that you’re not alone. You’ll have loads of people supporting you and trying to help. I bet your family is more than willing to lend a helping hand and look after your children when you’re busy. Similarly, you may find that the father is eager to be part of your child’s life. Which is why you need to heed my advice above and stay in contact with them! Let them see your child and look after them on weekends or set a schedule, so they get the child at certain times. Whatever you decide, don’t do it all on your own! Single parenting is hard, but you can make things easier for yourself. With my advice, you’ll find it’s much easier to cope, and you’ll become a better parent too. Heroes come in all shapes and sizes. Mine is 71 cms. tall and 8.3 kilos heavy. Instead of a flashy cape, he wears a drool-drenched bib with cute prints. My hero is none other than my 5-month old baby boy. Before he came into my life, I was a hopeless mess. I was in a desperate quest to find Mr. Right because I used to think that without a partner in life, I was nothing. So I searched high and low for a man to meet my emotional needs. I signed up for online dating sites left and right, and actively chatted with prospective partners. I never realized that dorks in sheep’s clothing were a dime a dozen. It was frustrating how I kept dating losers. When my baby boy was born, everything has surprisingly changed for the better. He has rescued me from the doldrums. It’s almost a miracle how I no longer see the value in scavenging for a life partner. I realized that I already have everything I need to be happy. My eldest daughter is happy, healthy and proves to be a smart young lady, save for her occasional intellectual diatribes on life as a tween. My baby boy is healthy and thriving. What more could I ask for? Sure it would be nice to have a man to hold hands with as we walk towards the sunset, but the idea is not something I pine away for anymore. I am content with my kids and the joy they bring me- dirty diapers and all. When my daughter came home from school yesterday, she could barely contain her excitement as she showed me what she was hiding behind her back- a cross stitching kit. She was beaming like a beauty queen who just bagged the Miss Universe title when she told me that her teacher handed a kit to each one of them in class. I couldn’t have been more surprised as I knew that she was hardly the Martha Stewart homemaking type of girl. She was more of a thrill-seeking and adventurous Pippi Longstocking. She then went ahead and showed me the pattern assigned to her. All I could think to myself was “Wow!” I knew that even I with all my patience wouldn’t be able to finish that cross stitch project. I couldn’t imagine how a grade four teacher can be such a sadist and give her kids a huge task. But because my daughter was a real trooper, she took it as a challenge that she just wasn’t ready to bow down to. As she ran her fingers through the multi-colored dmc threads which came with the kit, I can almost hear her whisper, “I can do this even if it looks boring”. And she is determined like hell to finish this project and make me proud. Little does she know that even as I write this, I’m already proud of her. I consider myself to be a fairly congenial woman, but no matter how friendly I am, I guess I’ll never really be friends with time. It always seems goes by so fast when I’m at my happiest. The end of my 78-day maternity leave is starting to rear its ugly head, and time has yet again sped things up. Such a killjoy! There are simply too many happy moments I do not want to let go of. I’ll miss looking down ( thanks to gravity taking its toll on my breasts, I have to literally look way DOWN!) at my little one as he peacefully suckles at my breast in the wee hours of the morning. Everything around us is so quiet and serene. I’ll miss the endless playback of lullabies and nursery rhymes in versions I never before thought existed. I’ll miss being home when my eldest arrives from school. It’s quite comforting when we both don’t need to rush doing her homework. I am able to chat more with her and peek into what goes on in a tween’s slightly melodramatic life. I’ll miss watching reruns of Friends. In my book, it’s still the funniest show ever. I’ll miss not having to think about my jungle of a workplace. Noisy kids in my library can really try my patience at work. But the clock ticks on, and I have to move with it. There will be happier moments ahead- whether I’m on maternity leave or not. It’s not the end. So I guess I’ll just hang a shining star upon the highest bough, and have myself a merry little maternity leave now. In between frequent trips to the bathroom and unwelcome heartburn episodes, I pause to reflect on this pregnancy. This bun is going to pop out of the oven in about six weeks, and I can’t help but compare it to my first pregnancy- nine years ago! There’s a whole world of difference between my first pregnancy and this one. For starters, I was married back then. I was treated like a queen. My husband and in-laws gave me everything I needed and wanted- from freshly baked pretzels to creamy milkshakes. I was a stay-at-home wife. I spent my days burying my head in books by Dan Brown. Umberto Eco’s writing filled every nook and cranny of my expectant brain. It was a blissful 9 months, having all the time in the world to do whatever my heart and mind desired. Fast forward to today, I’m the personification of a knocked up, pregnant single mom. This pregnancy came as a shock in the beginning. After I told this baby’s biological dad that I was with child, he chose to just turn a deaf ear. He simply vanished into thin air, like a fleeting yet utterly stinky fart. With just a few more weeks to go before I give birth, I see how this pregnancy has changed me in positive ways. For one, I no longer care about finding a life partner. I used to spend most of my time going on online dating sites to find my perfect match. I was on a quest to find that which I now realize is not important to my well being. I have plans for my first-born and this upcoming baby, but I also understand that sometimes, even the best-laid plans go awry. I am taking a leap of faith, gracefully accepting whatever surprises life has in store for us around the bend. My first and second pregnancy may be different in so many ways, but one thing’s for certain- they’re both miracles. The Pranayama breathing exercises I learned in the few yoga classes I went to are starting to prove to be really useful. They help restore my emotional and mental balance in this harried and frenetic world known as single motherhood. Because I’m basically going at it alone, I need all the help I can need- both physical and virtual. In the virtual aspect, I have found something to hold my hand and ease the parenting weight off my shoulders. 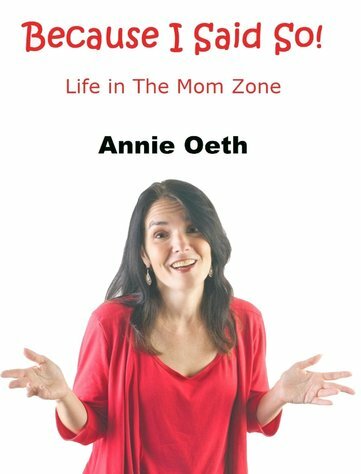 Because I Said So: Life in the Mom Zone by Annie Oeth, which was published in April 2014, has become my go-to book whenever I feel the pressure of parenting taking its toll on me. In this book, solo mom Annie presents various stories of laughter, tears, worries and fears which are all associated with being a parent. Each story tells of how mothers manage to find strength, love and humor even in the direst of situations. There was a time of retribution like no other in my growing-up years. It was when church let out. At no other time in no other day did more children get more beatings, spankings, whippings and whatnot than after church. Now let me preface this by saying our parents were not the “spare the rod” types. If you loved your children, the thinking back then was you would get to the seat of the problem. Rapidly. There were no time-outs back then. We kids would have loved those. Change is good. It always is. And I have to say that I just recently had an epiphany of sorts, and it has altered the way I think and feel in ways I could only previously imagine. I feel that I have always been overly dependent on my daughter. I almost feel sorry for putting her in a position where she was my wellspring of happiness and self-worth. I knew that on a subconscious level, the reason “Do You Wanna Build a Snowman” from Frozen keeps playing inside my head is that I have associated it with my daughter. Whatever she likes, I like too. It’s as if I’ve lost my identity and wrapped myself emotionally and mentally around her. That’s just totally unhealthy. She was my number one. Everything else took a step back. But when I started reading the Wealthy Single Mommy blog, I learned how important it is that we don’t put our kids first. Now before you feed me to the lions, hear me out. Yes, I love my daughter. I love her to the moon and back. But that doesn’t mean that I live for her. That she’s the reason for my existence. Eventually, she’ll grow up and have a life of her own. My job now is to be an example to her, to show her what it’s like to live a full and rich life. I have to show her that it’s not her obligation to make me happy, that I can do that by myself. I realize how my old mindset has carried over to my just-recently-ended romantic relationship. Probably one of the reasons it didn’t work out, was because my then boyfriend saw how much of a doting mother I was to my daughter. He felt out of place. He felt less than important. If I knew then what I know now, it would have made a whole world of difference. My daughter is staying at her Dad’s for two weeks. I’m at the halfway mark, and I’m proud to say that I no longer achingly pine away for her. The gassy anxiety spells I used to have are now a thing of the past. I enjoy my time alone, like a normal and healthy adult should. If and when love comes knocking on my door again, I’ll know better to give him the attention he needs and deserves. If he asks me out to a Gin Blossoms concert even on a weeknight, I’ll go. Happy parents make happier kids. If you know how to take care of yourself, then you’ll be better and more effective at taking care of your children. That’s how it all adds up in the parenting equation.